My recent mancave renovation unearthed a few bits and pieces that had been forgotten over the years. The fences and walls shown here had been sitting in a box since 1992 or so. Regular readers (there are some, honest) will know that I pretty rarely play fantasy games, preferring to focus on science fiction. One of my (many) pet gaming peeves is the tendency for players to dump any old bits and pieces lying around onto their gaming table to serve as terrain, regardless of the setting, resulting in jarring suspension-of-disbelief juxtaposition. Space troopers fighting alien bugs against a backdrop of tatty cardboard tudor buildings is a classic example. with regiments of yellow clad, ruffle-sleeved, twirly moustached pikemen wandering past ruined gothic city blocks being another unfavourite. I have christened this The Doctor Who Effect: no matter what is going on in that show it always look like its happening in Wales instead of an asteroid circling Proxima Centauri or whatever, which I find very distracting. I honestly dont understand why anyone interested in the imaginary and compromise filled world of miniature gaming is bothered playing if the game doesnt have some sort of visual narrative, of which the terrain is a crucial part, Whats the point otherwise? Appropriate terrain is at least as important as the toy soldiers themselves. Which is a roundabout way of saying that despite having made these terrain pieces twenty years ago, I havent played many games that required either rickety wooden fences or somewhat unconvincing “stone” walls. Until now that is. 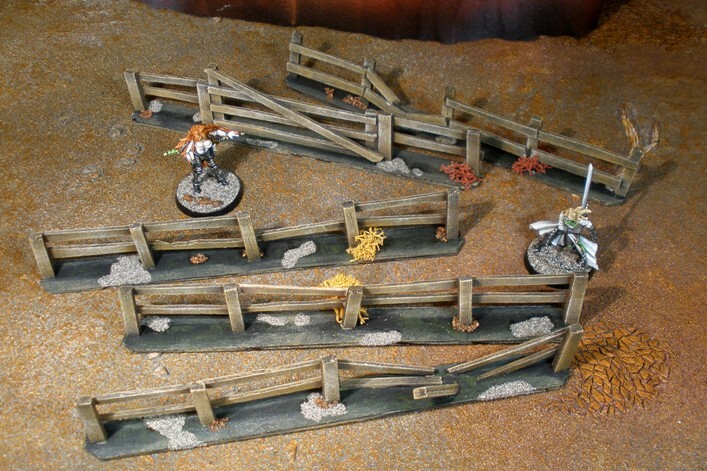 My recent foray into playing Malifaux has meant that these terrain pieces have come out of retirement. The fences are strips of balsa glued to each other and based on card. The walls are balls of air hardening clay stacked into soft looking rustic walls. Nothing fancy, but functional all the same. It is satisfying to use the pieces properly for the first time in nearly two decades. Since I took these photos I have gone back and stippled some colour onto the bases to get these pieces to fit into the Zuzzy mat baseboard colours a little better. I tend to see the terrain in a game as a lot like set design for a theatrical play. It is definitely possible to simply imagine the setting required, but it tends to be a lot more satisfying when the right visual cues are provided. Decent terrain isnt absolutely necessary, but it is a lot more fun. I have picked up a lot of bits for making terrain recently, so work on my sci-fi city should begin soon.